We’re all looking for ways to save big at the register. Well, I’ve found a way to make every coupon I use at my local grocery store worth an extra 25¢! How you ask? It’s as easy as 1, 2, 3! 1) Sign up at Swagbucks.com and use my special code SBCouponer to earn an extra 50 points, that’s 50¢ just for signing up! 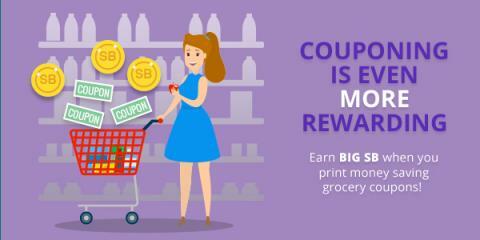 3) Use the coupons the next time you shop at your local grocery store. You’ll earn 25 points (25¢) for every coupon you use. But, that’s not all… This month you can earn 1 point (1¢) for every coupon you print, up to 25 prints per day. That’s an extra 25¢ every single day! So, you can earn money, even before saving at the store. Have fun shopping for groceries! The Swag Central blog is where you can find updates about the latest articles on Swag Central, my experience with swagbucks, Swagbucks tips, and the latest Swagbucks news. I love Swagbucks and want to help other Swagbucks users. Whatever questions you have, Swag Central is here to help! Copyright © 2019 Swag Central. This is a fan made site, and not affiliated with Swagbucks.com. "SwagBucks", "Swag Codes", "Swagstakes" and "Swidget" are trademarks of Prodege LLC. All trademarks, registered trademarks, and images appearing on this site are property of their respective owners.